I love wearing Pastels.Its soft, and girly and playful.Nothing like rocking a sugar factory, especially when sweaty days could soothe off with a radiant hue and perky smile, and dressing up in pastels beats me up into channeling my inner Easter Bunny. Enough said. This is another outfit we shot before entering the venue for the fashion week. 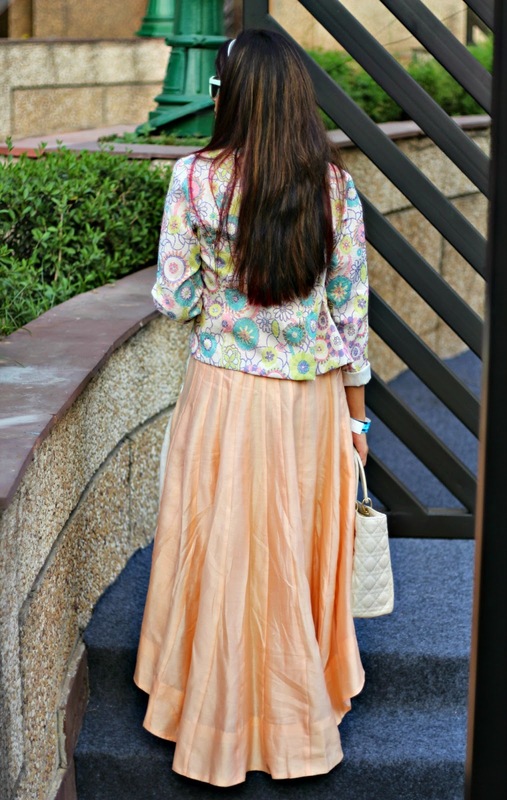 The trail Length Kurti came with pants, and I think I have formed a habit of leaving some and picking some , and then weaving into things I wear. Maybe someday you may see me wearing different feet(a.k.a shoes) The Kurta packed in a lot of sophistication, so I added these downtown Nike sneakers to go along, and who doesn't want to kick things up a notch when fashion week rolls up? 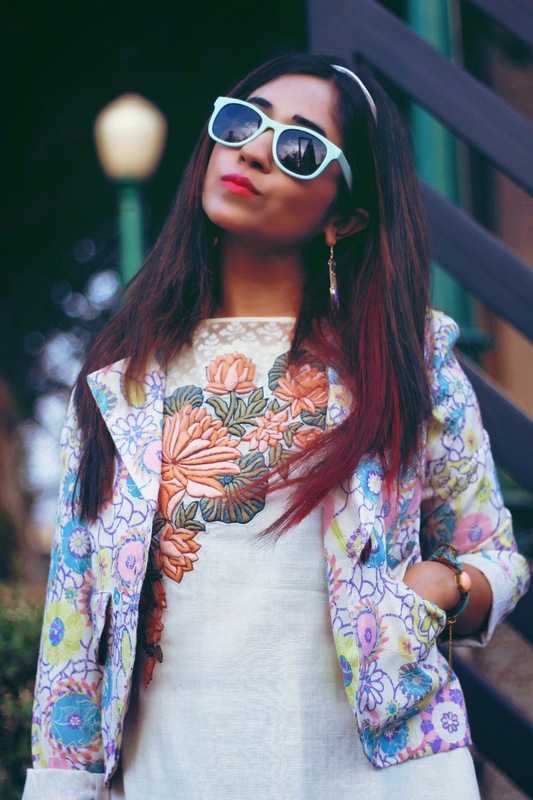 This jacket is another piece from my collection, and has all the pastel powers in one piece, which means only one thing - You can't really go wrong with summer blazers , especially with all the cotton candy colors popped in one . So why don't u all just dig in the whole amount of fabric going around in the photos, while I work on some fodder for my next post ? Your style is so unique and pretty that I am in love! 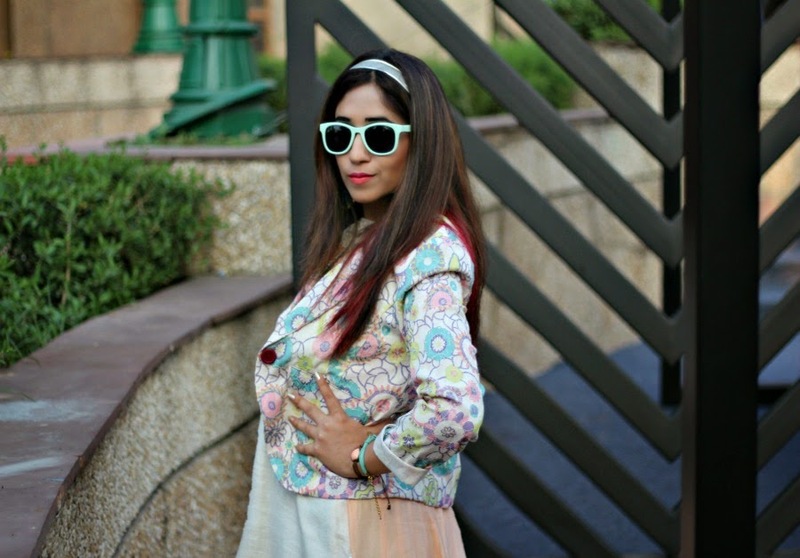 Totally loving that jacket and how you wore it with your teal sneakers! Omg. Layers of floral? Hi-lo? And amazing bright sneakers?! I love this! Beautiful outfit, love your sunglasses and jacket! Have a lovely and happy weekend! WOW! What a look! I love the blazer and this dress is just amazing - the skirt is awesome and so is the print on the top! So stunning, the florals are very beautiful. I have a very similar bag, it's the best. Thank you for visiting my blog and leaving me a lovely comment! I like yor flower jacket, nice combo the sneakers are so cool! Like your bag too. love this free spirited flowy look, gives me a real 60s vibe!! Wow! I am loving those sunnies and of course the blazer. You look amazing Surbhi! I love that dress, it's so cool! Great look! Really nice outfit dear!! Love all the colors!! I adore this outfit of yours, the dress is so, so pretty and I love how you styled sneakers with it! Just lovely. Love this look, the colours suit you so well! You look amazing! Love the whole post! Such a beautiful outfit, really love the light colors for spring! omg love the outfit just perfect. Love this outfit on you, especially the skirt! What an eccentric look. You look so cute. I love the blazer. Vibrant colors are amazing. I love your outfit! 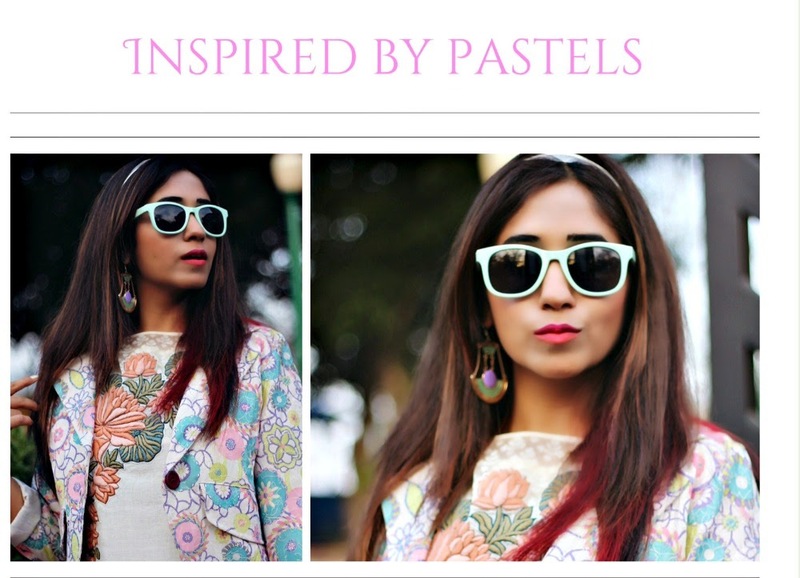 ♥ I think pastels are the best thing in spring and they are really girly too!